Kensington Vertical Window Shadings combine the beauty and elegance of a drapery with the convenience and operation of a blind. 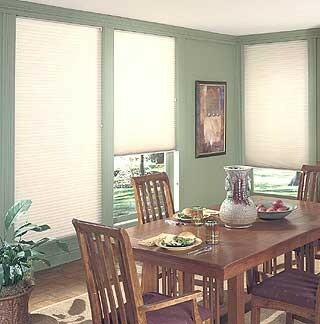 The fabric colors coordinate exactly with the Kensington Horizontal Window Shadings providing the perfect compliment. The Vertical Window Shadings offer a full range of motion to assure control over privacy and light. Vanes can easily be rotated open for an unobstructed view or closed for diffused light. For opening the shading completely, split stack and side stack options are available. 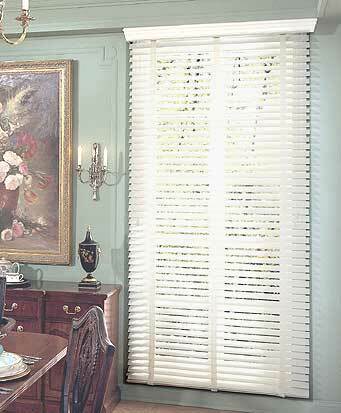 Kensington Vertical Window Shadings are available in 16 beautiful fabric vane colors. All colors can be made in either light filtering or room darkening styles to provide the perfect level of privacy and light control. Kensington Window Shadings are treated with a special soil and dust-resistant finish, making them anti-static and easy to maintain. In the event that a vane is damaged or stained, individual replacement vanes are sold separately. For a lifetime of enjoyment, these shadings are protected by a limited lifetime warranty. 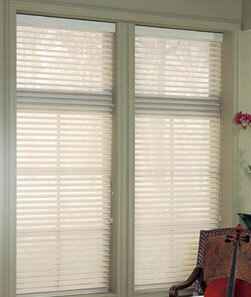 Kensington Horizontal Window Shadings will provide a beautifully elegant look to any room to your home. 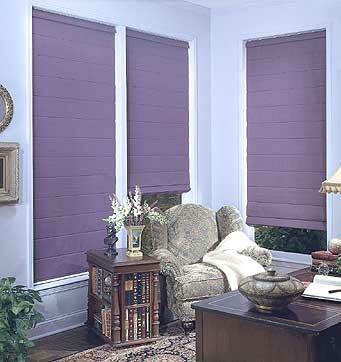 The fabric colors coordinate exactly with the Kensington Vertical Window Shadings providing the perfect compliment. Fabric vanes float between two layers of soft, knitted sheer fabric. Five viewing options allow for optimal light and privacy control. The unique “view-through” when raised option allows the shade to be raised with the vanes fully opened. Kensington Horizontal Window Shadings offer a choice of 16 light filtering and 5 room darkening vane fabric colors depending on the desired level of light and privacy control. Kensington Horizontal Window Shadings are treated with a special soil and dust-resistant finish, making them anti-static and easy to maintain. For a lifetime of enjoyment, these shadings are protected by a limited lifetime warranty. 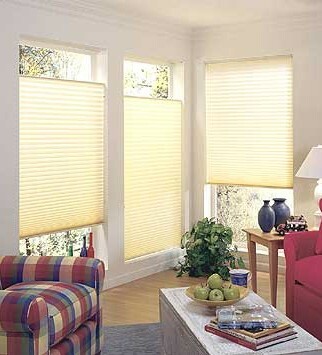 Kensington Honeycomb Shades combine soft, seamless fabrics with crisp, even pleats that hold their shape indefinitely. Perfect for virtually any size or shape window, Honeycomb Shades offer hundreds of gorgeous colors, a striking array of distinctive fabrics, ½”, 3/8" and 3/4" pleat sizes, and design options to cover most any window. 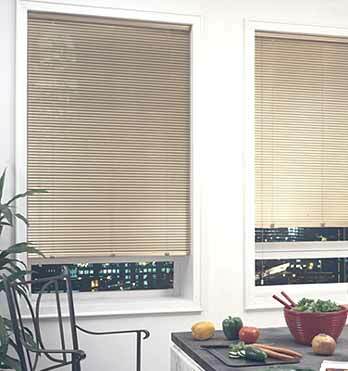 Kensington Honeycomb Shades are available with Continuous Cord Systems and a Cordless system, which eliminate the danger of dangling cords to children and pets. Other design options include Top-Down/Bottom-Up Shades, Day-Night Shades, Arches, Skylights and Specialty Shapes. Kensington Honeycomb Shades also offer a variety of light and privacy control options with light filtering, room darkening, and blackout fabrics. Honeycomb pleats create an insulating pocket of air that helps keep out the summer heat and winter cold. They also block out the sun's harmful rays and help protect furnishings from fading. Virtually maintenance free, they're anti-static, treated for prolonged stain resistance, equipped with long-lasting, reliable hardware, and protected by a limited lifetime warranty. 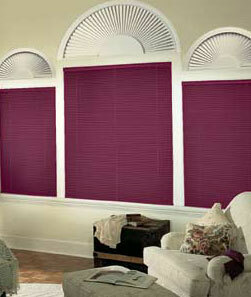 Kensington Pleated Shades are so versatile; they complement any window in any room. Designed to be as functional as they are beautiful, they feature crisp, even pleats and high performance hardware including a reliable cord lock system that operates the shade smoothly and evenly. The collection includes over a dozen fabric styles, from the elegant look of silk to the charm of old-world lace. Color choices can be made from a generous palette of bold, bright, and soft tones that will enhance any room décor. Add a Privacy or Blackout liner to any shade to increase privacy and light control. Kensington Pleated Shades offer several design options including Top-Down Shades, Day-Night Shades, Arches, and Specialty Shapes. A Continuous Cord System is also available with the Pleated Shades. Kensington Pleated Shades have been designed for years of smooth, carefree performance and are further protected by a limited lifetime warranty. Kensington Roller Shades, one of the most basic yet beautiful window treatments, are available in ten diverse fabric styles including sheer, semi-sheer, semi-opaque, and opaque. Choose from up to sixteen mood-enhancing colors to create the perfect complement or contrast to any room. For more decorative look, there's a wide selection of elegant gimp, loop, or brush trims available in softly muted tones or jazzy primary hues. 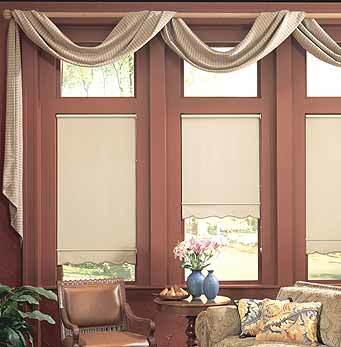 Kensington Roller Shades also feature a variety of bottom hem styles that provide a more elegant finish to the shade. A concealed, chain-driven clutch system featuring a continuous cord loop offers superior operation by allowing the shade to glide smoothly and hold its position. All are protected by a limited lifetime warranty. 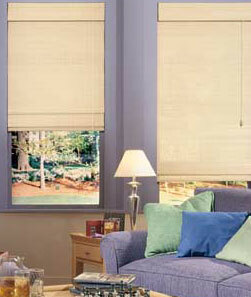 Kensington Roman Shades are available in a wide assortment of versatile materials and colors. Designed to make any room look more distinctive, their rich, luxurious appearance is complemented by their functional excellence. These shades are offered in two profile styles, full or flat, and are available in eight fabrics and 50 colors. 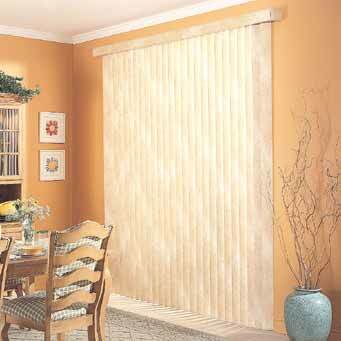 The fabric self-valance conceals both the headrail and the shade when raised. Kensington Roman Shades will provide years of trouble-free operation, additional energy efficiency and low maintenance, and is further protected by a limited lifetime warranty. Kensington Woven Woods Shades are fashioned from natural reeds and woods to help create informal surroundings for family rooms, sun porches, kitchens and bathrooms. Every shade has its own distinctive texture, grain, color, and pattern that can change the mood of the room from exotic to casual or rustic. These smart, affordable shades can be mounted inside or outside of the window frame with screw-and-eye hangers. A pulley and cord lock system allows you to fix them at any level. Each shade is covered by a limited lifetime warranty. Kensington Alternative Wood Blinds are an affordable alternative to hardwood blinds. The look and feel of natural wood is produced from a combination of real wood, non-toxic synthetic materials and a unique manufacturing process. These blinds are perfectly consistent in appearance, with no wood flaws or dye lot variations. Available in four slat styles... Standard (2 inch)... Shutter slat (2-1/2 inch)... Contour slat and a uniquely shaped Privacy slat. And for endless decorating possibilities, choose from a large selection of the most popular blind colors and fashion tapes. Kensington Wood Blinds bring the solid look and warmth of real hardwoods, complementing the surrounding decor, enhancing and refining the beauty of any room and giving your home a feeling of warmth and sophistication. A two-inch slat is offered in a wide selection of colors and finishes that blend beautifully with any decor. Also available are a variety of fashionable tapes and trim options to complement, contrast or match your wood blind selection. Crafted from 100% top quality hardwoods, Kensington Wood Blinds act as a natural insulator, are easy to maintain, and are constructed to last a lifetime. 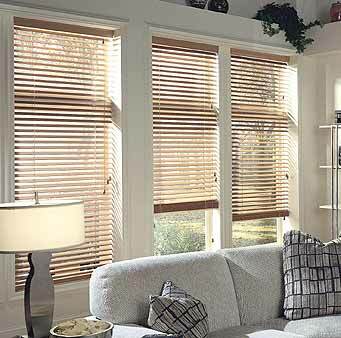 Kensington Wood Blinds are also backed by a limited lifetime warranty. Kensington Aluminum Blinds offer a classic style that works well with any decor. These sleek, sophisticated blinds are made with high-quality aluminum alloy and coated with baked-on lead-free colors to last a lifetime. At home in bedrooms, bathrooms, kitchens, or any room in the house, our aluminum blinds provide excellent light control and are a handsome complement to every window. They come with crash-proof cord locks, safety tassels, easy maintenance features, and a limited lifetime warranty. 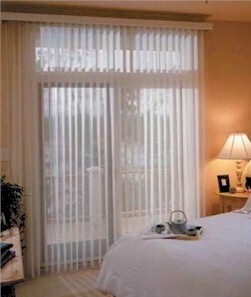 Kensington Vertical Blinds can make a small room feel larger or a large room more intimate. Use them alone or accent with coordinating valances or fabric top treatments. Choose from a range of fabrics for warmth and softness, aluminum vanes for brightness and easy maintenance, or vinyl verticals for a striking, sculptural look. Kensington Louvered Arches are a great way to give an existing arched window a new look. They also provide additional energy efficiency and their slats can be independently rotated to control outside light filtering into a room. The Louvered Arch looks like wood but is made from PVC material that is heat-fade and moisture-resistant. The arch is fully assembled, easy to install, and very economical over custom-made fabric treatments, wood blinds, and shutters.